Determine how many people you are planning to accommodate in your Tent. Ask yourself if it is likely that you will need extra room for your Backpack, storing other equipment, cooking, or for a pet. If you are going to do this then it might be wise to add one or two persons to your Tent's capacity. Most tent manufacturers take some liberty when discussing capacity. A two-person tent will most likely just be large enough to hold two average size people. If you are tall or like a lot of personal space, for two people you will probably want to consider a three-person tent. Determine what level of protection your Tent should offer. If you anticipate use in the worst of conditions then go for a 4-season Tent. For less rough conditions, go for a 3-season type. There are many kinds of Tent structures and determining what type is best for your use depends on the weather and temperature conditions the tent is going to be used in. Windy Conditions require a sturdy construction built on a strong pole design with multiple tie-downs and with an aerodynamically-shaped shell. Hoop, Wedge, and Dome Tents are the strongest shapes for windy conditions. Snowy Conditions require steep walls to shed snow. Bright colors are preferred (like orange, red, or yellow) that will make the Tent stand out in the snow. Key features include snow flaps and vents that will help with ventilation even when the tent is partially snowed in. Rainy Conditions require a tent with a waterproof fly and a bathtub style floor that is high enough to protect against ground water. Condensation is a challenge so splashproof peak vents and good overall ventilation are key features. Sunny Conditions require a UV-resistant material, and light-colored material is preferred. For backpacking in the spring, summer, or fall. Well-vented body for use in hot summer temperatures. Full-coverage canopy or rain fly to keep you dry in the rain. For mountaineering and winter backpacking. All vents can be closed during storms. Tougher materials than three-season tents. Multiple guy-out points for anchoring. Tall, steep walls create lots of interior space. These are the most-common tents available. Nearly every backpacker has a three-season tent, and they’re the go-to choice for most trips. Three-season refers to Spring, Summer, and Fall—the ideal times to use one of these tents. If you plan on traveling far from the car and there’s no snow on the ground, you probably want a tent from this category. Despite what the name implies, four-season tents are actually one-season tents: winter. Both the canopy and body feature stronger materials than three-season tents, and the body shape maximizes resistance to high winds and heavy snow loading. Take these tents on winter camping and mountaineering trips. These large tents make a great choice for car camping; you wouldn’t want to carry one very far. Family tents use less expensive materials than their backcountry counterparts and should not be expected to handle the same nasty weather conditions (though some are pretty stout). So why not just buy a three-season tent? Well, family tents usually cost about half as much, and they have far more living space. One or two straight poles with the Tent cover spread out create a covered ground area. They are mostly used for quick shelter and generally light weather conditions. One central pole and the Tent cover pulled tight and spread out around the center pole form a pyramid shaped pocket. Pyramid Tents are rare in Hiking as the center pole effectively divides the Tent in multiple smaller compartments. Two-legged frames at the outer ends of the Tent with the Tent cover form a triangular pocket. Old backpacking tents were often A-frame Tents. The increased roominess of hoop tents and domes has replaced most A-frame tents. Add a ridgepole and a center hoop to the traditional A-Frame to create a larger volume version of the traditional A-frame pocket. Modified A-Frame tents are also becoming rare in Hiking. Use one to three hoops with the Tent cover to form a tubular pocket. The curved walls give a bigger volume with the same ground surface. Hoop Tents are surprisingly strong as they divide pressure over the full length of the hoops. Two intersecting hoops with the Tent cover form a square to round pocket. These tents are very popular in Hiking as they combine great strength in combination with the least use of material and weight. Three or more intersecting hoops with the Tent cover form a multi-faceted ground floor with a dome. 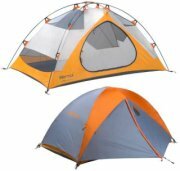 The added hoops give this tent increased strength in comparison to Wedge Tents. However, they are mostly pretty difficult to erect. Most 4-Season tents are domes with four intersecting hoops. You can move them to another location without having to take down and rebuild the tent. You can easily drain and dry a freestanding tent by picking it up and hanging it upside down. However, all tents including the freestanding type derive a lot of their strength from being anchored down by stakes and guy lines. Single Wall Tents use a single layer of material for the shelter. This single layer of material must provide water and wind resistance, durability, breathability, etc. Single wall tents are ideal for trips where weight and space are the primary concerns. They are best suited for lightweight backpacking trips, long backcountry ski tours, or lightweight alpine climbs. Double Wall Tents use an outer fly sheet and a separate inner tent. The outer fly sheet is made of waterproof material and the inner Tent is made from breathable and insect proof material. The inner tent transports moisture to the outer fly sheet. Double wall tents are better suited for use in rainy or hot weather. Double wall tents offer better rain protection and vent better than single wall tents, so there's more airflow and less condensation. Double wall tents are best suited for trips where multiple people will be in the tent, and you will be in the same camp for several nights(base camp). Hybrid Tents utilize both single wall and double wall construction. A common approach is to use a double wall construction on half of the tent, and have the other half utilize a single wall construction. The hybrid design is supposed to deliver the breathability and condensation control of a double wall tent without the weight penalty of a tradditional double wall shelter. There are a number of issues to consider when selecting a tent color. Low impact camping purists suggest getting a tent that is green or brown in color so it blends in with the surrounding terrain, and won’t be easy to see by passers by. Conversely, search and rescue organizations recommend a bright colored tent of yellow or red for the opposite reason, so it stands out and is easy to see. The color of a tent will affect how much light and to an extent how warm a tent is. A light colored tent that is yellow, white, or beige will let in more light and will tend to reflect off heat. A dark colored tent that is blue, forest green, black, or red will let less light in and will absorb more heat during daylight hours. Tents with 2 doors weigh more than a tent with a single door. However, the convenience of a second door may be well worth a few extra ounces. This is usually true for tentss that hold three or more people, or for tents that will be used for a base camp shelter. For family tents weight is usually not a primary concern, so the practicality and convenience of a 2nd door is worthwhile. Vestibule provide additional covered space to store gear without taking up space inside the tent. Vestibules can also provide additional shade from the sun, and offer additional weather protection for doors, etc. Lightweight shelters may not utilize a vestibule to save additional weight. Some shelters offer an optional / removable vestibule. Tents use vents to improve air flow and to reduce condensation from building up inside the tent. 4 season tents typically allow the vents to be closed to provide additional protection during storms. Footprints for tents serve a few different functions. They reduce wear on the floor of the tent, thus prolonging the life of the shelter. They can also be used to provide additional water resistance. Some double wall shelters allow a "fast and lite" pitch where you pitch just the rain fly and the footprint(leaving out the inner tent). This is done to save weight when weather and bugs are not a problem.